Deciding when is the right time to start thinking about in-home senior care for an aging parent can be difficult. There is an emotional toll when you face the fact that the person who took care of you for your entire life may now require someone to take care of them. But there is also the burden of deciding when in-home care should start. You don’t want to have a caregiver come in too early if your parent or loved one can still take care of themselves, and you certainly don’t want to wait until a fall or accident happens. 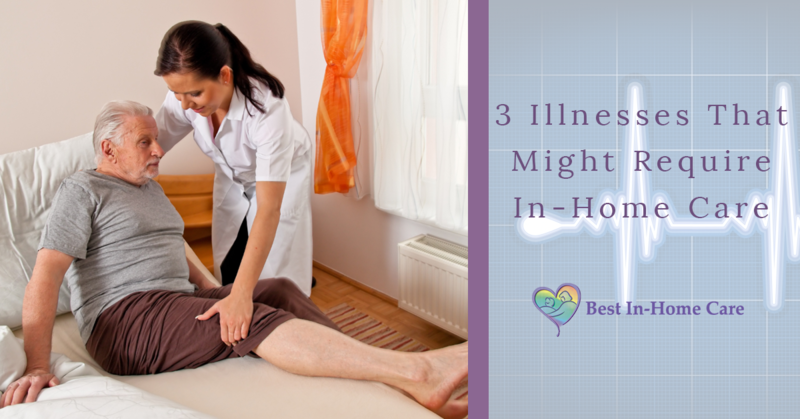 While there is no truly right or wrong time to start looking into in-home care for an aging loved one, there are certain illnesses that may soon require in-home care to some degree. Today, we’d like to talk about a few of the most common conditions that may require a person to have in-home health care. Alzheimer’s disease or dementia: Dementia is a general term used to describe various symptoms that range from memory loss to impaired reasoning skills to changes in personality. Alzheimer’s disease is one of the most common causes of dementia. If dementia progresses too far, it can become difficult, and even dangerous, for a person to continue to live without professional caregivers. Dementia patients are typically forgetful of what they are doing in the moment, and can do things like forget to turn off a gas stove, forget where they live, or forget to take important medication. Diabetes: Diabetes occurs when the body cannot produce enough insulin, and can result in high blood sugar levels. If not under control, high blood sugar can cause blindness, kidney failure, and nerve damage, and can lead to strokes, heart disease, or other macrovascular illnesses. A special diet and exercise regimen can help manage diabetes, as well as daily medication and insulin shots. An in-home caregiver can help with meal prep, insulin injections, and help monitor blood glucose levels. They can also help introduce light exercise routines to your loved one, and be there in case they should fall ill due to diabetes. Parkinson’s Disease and other degenerative disorders: Muscular degenerative disorders, such as Parkinson’s disease, ALS, spinal muscular atrophy, or muscular dystrophy all result in the eventual loss of muscle use. Some of these affect motor neurons in the brain, which can make moving, speaking, eating, and even breathing difficult. A trained caregiver can allow for a person with one or more of these disorders to still live in their own home, while still being assisted with daily tasks from bathing, to cooking, to running errands, and more. Our kind caregivers can assist people with all sorts of needs. A professional caregiver can help run errands, remind a patient to take their medication, do light housekeeping, assist with bathing, help with transferring from a bed or wheelchair, or simply be a companion to your loved one – all while treating them with the dignity and respect they deserve. If your loved one is experiencing any of the above conditions, or another chronic illness, consider Best In-Home Care in Lubbock for a passionate, considerate, and dedicated caregiver. Contact us today for a free in-home assessment, and to find out how we can provide at-home care for your loved one.